Americas gateway to the universe. Leading the world in preparing and launching missions to Earth and beyond.October 23, 1998 John F. Kennedy Space CenterVol. 37, No. 21 Spaceport News STS-95: John Glenn rides again Looking back on the years since his historymaking launch, John Glenn reflects fondly on the early days, while keeping a keen eye on the future. Weve gone from back in those days, where we were just trying to find out if we can do it, he noted, to now, where these flights are literally on the cutting edge of science, doing things that benefit directly or have the potential of being of enormous benefit to everybody right here on Earth. And thats what the space program is all about. (See STS-95, Page 4)Time and space and Life: John Glenn made the cover of Life magazine in February 1962 for his historic journey aboard Friendship 7, in which Glenn was the first American to orbit the Earth. During his World War II service, he flew 59 combat missions. In July 1957, he set a transcontinental speed record from Los Angeles to New York, spanning the country in three hours and 23 minutes. This was the first transcontinental flight to average supersonic speed. And when he launches aboard the Shuttle Discovery on Oct. 29 at 2 p.m., John Glenn Jr. will be setting a new record yet again. During STS-95, at age 77, Glenn will become the oldest person to have flown in space. Back on Feb. 20, 1962, when Glenn flew in his Friendship 7 Mercury capsule, the largest mystery facing the young NASA space program was whether humans could even survive and me, and the rest of the seven, the doctors predicted some dire things back then. Would your eyeballs change shape, for instance? In my spacecraft, Friendship 7, thats in the Smithsonian, if you look up at the upper part of the instrument panel, the little eye chart is still up there ... with the different sized letters, and I was to read that thing every 20 minutes during flight and see if my eyes were changing shape, Glenn remarked. Some in the hostile environment of space. Things have changed so much since the early days, recalled Glenn in a recent interview, looking back on his first flight into space. Back when I went up to begin with, and when Al Shepard was getting ready to go, and Gus I started having my troubles with the automatic control system late in the first orbit. The capsule started to swing over to one side along the yaw axis and then correct itself with a large expenditure of hydrogen peroxide fuel. Then it would do the same thing again. Later on, it started yawing in the other direction. Something was obviously wrong with the system and it became necessary for me to control the capsules movements by hand. For most of the rest of the trip I controlled the capsule myself. Astronaut John Glenn penned these words reported in Life magazine in its March 9, 1962 issue. This did cut down on other activities wed planned. It meant that I had to cancel out several of the experiments and observations I wanted to make on the second and third orbits. I had a number of instruments on board, including one which was designed to make a series of tests of the Suns corona, the brightness of clouds, the ability of a pilot in space to adapt himself to darkness and withstand the effects of weightlessness. I felt completely relaxed at zero G but I did conduct one experiment to see if the long period of weightlessness was having any ill effects. First I started moving my head up and down very slowly, then I moved it from side to side. ... I still had no feeling of nausea or disorientation, so I speeded up until I was shaking my head and rolling it and nodding it as fast I could, with no more sensation than one would expect doing this on the ground. ... Weightlessness, at least for a period of a few hours, is no problem at all in space flight. This, actually, was one of the major findings of the mission. SPACEPORT NEWSOctober 23, 1998 Page 2 If getting enough fiber was of great interest in the s, it will be paramount in the new millennium. Fiber optic technology has been around for quite awhile, but while its use in ground-based systems and airplanes has been widespread, demonstrating its effectiveness in space has been much more limited. Weight reduction and higher data transmission rates are only two of the benefits offered by this technology that made KSCs Shuttle Payload Upgrades team take a hard look at its potential. We look at projects based primarily on their ability to reduce payload processing time and increase customer friendliness, said Melodie Porta, KSC Shuttle Payload Upgrades project manager. One technology demonstration that became readily apparent for high recommendation by our team is the Fiber Optic Flight Experiment [FOFE], which will be flying on STS-95, she continued. The technologys ease of installation and testing, durability and on-orbit performance are all being investigated. The long-term objective of this experiment is to use fiber optics to standardize payload interfaces in the payload bay, thus reducing processing time in the Orbiter Processing Facility. Teaming up with Goddard Space Flight Centers Hubble Space Telescope Orbital Systems Test (HOST) payload team, the FOFE group hopes to confirm that optical fiber is a viable option both in ground processing and in the Space Shuttle environment. HOST will provide data to the experiment transmitted through fiber cables running alongWill getting a little bit of fiber help the Shuttle system overall?A fiber optic system is similar to most copper wire systems that fiber optics are replacing for phone use and data transmission across networks. The major difference is that fiber optics use light pulses to transmit information down fiber lines instead of using electronic pulses to transmit information down copper lines. Goddard Space Flight Center employees Ray Lundquist, Rus Burgess and Roger Chiei, left to right, review fiber optic information on a payload and general support computer, like one that will fly during STS-95 to collect information on fiber optic technology performance on board the orbiter Discovery. Burgess has been instrumental in the pre-launch testing and procedures at Kennedy Space Center for the Fiber Optic Flight Experiment that will run as part of HOST.the payload bay into the aft flight deck, where a payload and general support computer will record it. HOST also will transmit the same data via standard telemetry routes so that both data streams can be compared after the mission. Goddard Space Flight Center (GSFC) served as a consultant to the Shuttle Payload Upgrades team for FOFE. The experiment is a partnership between Kennedy Space Center, Johnson Space Center and the Goddard Space Flight Center. Goddard partnered with us to put a fiber optic interface in the HOST controller so that we could have their data to compare with the data that they transmit down the second telemetry route, noted Porta. HOST essentially is providing us with a ride, as it were, on their mission, and Goddard also has provided mission management support. Since fiber optic expertise resides at Goddard, its been a really good fit and partnership. Cheryl Malloy, another KSC team member, noted that John Kolasinski of Goddard Space Flight Centers team received the NASA Exceptional Engineering Medal for his work in fiber optics this year. Goddard has allowed us to use this expertise and provided some of their hardware to help keep costs down for the experiment, she added. GSFC plans to use KSCs Multi-Operation Support Building as the Payload Operations Control Center for HOST, allowing Goddard to reduce the number of personnel required for launch site and mission support. The Hubble Space Telescope Orbiting Systems Test platform is carrying experiments to validate components planned for installation during the third Hubble Space Telescope (HST) servicing mission and to evaluate new technologies in an Earth-orbiting environment. There are seven experiments on the HOST platform that are being tested to demonstrate that the actual electronic and thermodynamic equipment scheduled for installation into the telescope will perform acceptably in the radiation and zero gravity environment of space. The third Hubble Space Telescope servicing mission currently is scheduled for a mid-2000 launch. Following the HST second servicing mission in February 1997, HST operators noticed anomalies involving electronic systems in the Solid State Recorder, the Space Telescope Imaging Spectrograph and the Near Infrared Camera and Multi-Object Spectrometer (NICMOS). These anomalies appear to be caused by space radiation interacting with the extremely sensitive electronics. The HOST mission on STS-95, which will fly in an orbit similar to that of the Hubble Space Telescopes orbit, will help identify radiation-induced anomalies in equipment before it is installed on the HST. Engineers can then implement corrective redesign to prevent these anomalies from occuring when the new hardware is placed on the telescope. Engineers will continuously monitor the effects of ionizing radiation on the HST 486 computer and the solid state recorder during the HOST mission. They also will monitor the radiation effects on new technology, including the HOST controller, electronics service module, pulse height analyzer and the Fiber Optic Flight Experiment. 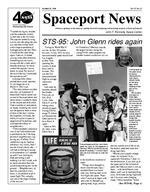 SPACEPORT NEWSOctober 23, 1998 Page 4 STS-95 ...(Continued from Page 1)That was Glenn. This is now. I was quite taken aback when I saw the Mercury spacecraft for the first time, recalls Bob Buckley, then an aerospace technologist for Project Mercury. In my mind, I was thinking that this was a large vehicle, and it was only 9 feet tall and 6 feet wide at the base, and looking into the hatch where John Glenn was going to ride, it looked like a telephone booth with all of the equipment packed behind him.doctors predicted your eyes might change shape enough that you wouldnt have enough vision to read the instrument panel properly. It was a time when we were just starting out with the building blocks, that have gone on through the years flight by flight to the tremendous capability that we have now. In the 121 crewed space missions since Glenns flight during the Mercury, Gemini,Occupation: Full-time NASA astronaut Age at flight: 40 Personal status: Wife Annie, two children Exercise: Running Mission purpose: To send and observe first American in Earth's orbit Occupation: U.S. senator from Ohio Age at flight: 77 Personal status: Wife Annie (married 55 years), two children, two grandchildren Exercise: Speedwalking Mission purpose: To conduct a range of scientific experiments, including those to study effects of space flight on an older person Glenns next flight will be nothing like the first. This time he will fly for nearly nine days, not just several hours. This time hell follow a path blazed by hundreds of astronauts during decades of missions. This time hell be part of a crew, one of seven people working together to make the trip a success. In 1962, the only crew member he could rely on was himself; he was flying solo. This time, he wont be in charge. Instead, hell be part of the team, and the focus of experiments on how people age. His first flight, which circled the globe three times, developed several problems. One was especially dire. A meter indicated that a clamp holding the capsules heat shield may have prematurely released. If Glenn tried to re-enter the atmosphere without the shield, he would be incinerated. As it turned out, the heat shield had not come loose, and Glenn parachuted safely into the Atlantic, 700 miles from where he began the trip five hours earlier in Cape Canaveral. Recently Glenn asked NASA if he could fly again to conduct space-based research on aging, but only if he met the Agencys rigid physical and mental requirements. NASA Administrator Daniel Goldin responded in January by telling the public that not only is John Glenn a Marine test pilot, an astronaut, and the first AmericanMuch has changed in society, technology and the world in the 36 years between John Glenn's historic orbit in 1962 and today. Here are but a few of the many changes since his Feb. 20 launch three and a half decades ago.to orbit the Earth, he brings a unique blend of experience to NASA. He has flight, operational and policy experience. He is part of the NASA family, an American hero, and he has the right stuff for this mission. You know, people always say, We had key people in the program. What we had we had a chain. And each link was important. Because if it breaks, it wouldnt go. You need the whole chain to make it happen. Guenter Wendt, pad leader, McDonnell Aircraft Corporation (Project Mercury) Apollo, Skylab and Shuttle programs, more than 200 Americans have flown in space. Glenn, who inspired many current astronauts to pursue spaceflight as a career, continues to inspire people of all generations as he prepares for a return to space. The wealth of scientific data accumulated during these space flights validate apparent similarities between the effects of spaceflight and aging. Glenn will be a test subject for specific investigations that mimic the effect of aging, including loss of muscle mass and bone density, disrupted sleep patterns, a depressed immune system and loss of balance. SPACEPORT NEWS Page 6 October 23, 1998New child development center administrator namedBillie Abner Silver Snoopies presented Astronaut Joe Tanner presented the prestigious Silver Snoopy Award to the following employees on Sept. 22: Tommy Ford, EG&G Angela Smibert, Dynacs Engineering Co., Inc. Nancy Tuttle, Dynacs Engineering Co., Inc.Deep Space 1 is ready to go Billie Abner was recently named the new KSC Child Development Center administrator. The center, located at A Avenue and 5th Street, offers child care and development services to children of KSC and Cape Canaveral Air Station employees. Her responsibilities include planning, coordinating and managing the centers day-to-day curriculum and activities for children. In this role, Abner participates with the KSC Exchange Council and its general manager in the development of long-range plans and goals of the Child Development Center. Abner received a bachelor of science degree in elementary education and early childhood from Lock Haven University in Lock Haven, Pa. For more information about the center, call 867-KIDS.KSC hosted first Partners in Education and Research Conference Since its inception 40 years ago, NASA has maintained a strong relationship with university faculty and students by sharing information regarding its mission, utilizing the skills of faculty and students to achieve its mission and providing opportunities for faculty and students during their academic careers. These were the words of KSC Director Roy Bridges when he opened the first Partners in Education and Research Conference hosted by KSC, which was held Oct. 6-8 at the Cocoa Beach Hilton. The goals of the conference were to enhance dialogue among representatives of academia, government and industry about ongoing research and education efforts; to discuss the future direction of KSC and NASA; and to present opportunities for faculty and students to become involved in space-related activities. Approximately 200 participants attended the conference. Program sessions consisted of panel discussions and paper presentations involving university faculty, KSC staff and industry representatives. Topics focused on technical areas that KSC is currently working on Conference attendees were treated to a tour of Launch Pad 39B.and is interested in for the future. Topics included space life sciences, environmental and bioregenerative systems, integrated intelligent systems, exploration technology development and reusable space transportation technologies. On Launch Pad 17A at Cape Canaveral Air Station, workers begin encapsulating Deep Space 1 with the fairing (right side). Targeted for launch aboard a Boeing Delta II rocket as early as Oct. 24, Deep Space 1 is the first flight in NASAs New Millennium Program and is designed to validate 12 new technologies for scientific space missions of the next century, including the engine. Propelled by the gas xenon, the engine is being flight-tested for future deep space and Earth-orbiting missions. Deceptively powerful, the ion drive emits only an eerie blue glow as ionized atoms of xenon are pushed out of the engine. While slow to pick up speed, over the long haul it can deliver 10 times as much thrust per pound of fuel as liquid or solid fuel rockets. Other onboard experiments include software that tracks celestial bodies so the spacecraft can make its own navigation decisions without the intervention of ground controllers. SPACEPORT NEWSPage 7 October 23, 1998KSC Open House opens doors to about 33,600 peopleKennedy Space Centers annual Open House was held on Saturday, Oct. 10 and drew a crowd of more than 33,600 employees, families and friends to Americas spaceport. Visitors were able to drive by the Space Shuttle Discovery poised for launch on pad 39B, view International Space Station hardware in the Space Station Processing Facility, meet astronauts, tour the Orbiter Processing Facility, discover the different laboratories around KSC and Cape Canaveral Air Station and much more. Here are a few photo highlights of the day. Cars lined up to get a view of the Space Shuttle Discovery poised on Launch Pad 39B. Discovery is set to launch on Oct. 29 for STS-95. The Dalmation Dog (a.k.a. KSC Fire Services Captain Steve Kelly) was a big hit with the little guests to this years Open House. A family enjoys the International Space Station Center tourist stop, above, while Amanda Hankins, below, tries her hand at the hose in learning about how to extinguish fires. Astronaut Mark Polansky signs autographs for crowds gathered around Orbiter Processing Facility 3, where Columbia was on display. John F. Kennedy Space Center Managing editor. . . . . . . . . . . . . . . . . Bruce Buckingham Editor. . . . . . . . . . . . . . . . . . . . . . . Susan Maurer Editorial support provided by Information Dynamics Inc. Writers Group. NASA at KSC is on the Internet at http://www.ksc.nasa.gov USGPO: 733-112/80017Spaceport News Spaceport News is an official publication of the Kennedy Space Center and is published on alternate Fridays by the Public Affairs Office in the interest of KSC civil service and contractor employees. Contributions are welcome and should be submitted two weeks before publication to the Media Services Branch, AB-F1. E-mail submissions can be sent to Susan.Maurer-1@ksc.nasa.gov SPACEPORT NEWSOctober 23, 1998 Page 8 In KSCs Spacecraft Assembly and Encapsulation Facility-2, the Mars Polar Lander is secured on a workstand for testing, which includes a functional test of the science instruments and the basic spacecraft subsystems. The Mars Polar Lander is targeted for launch from Cape Canaveral Air Station aboard a Delta II rocket on Jan. 3, 1999. The solar-powered spacecraft is designed to touch down on the Martian surface near the northern-most boundary of the south pole in order to study the water cycle there. Deep Space 1 is lifted from its work platform in KSCs Payload Hazardous Servicing Facility, giving a closer view of the experimental solar-powered ion propulsion engine. The engine is the first non-chemical propulsion to be used as the primary means of propelling a spacecraft. Above the engine is one of the two solar wings, folded for launch, that will provide its power. Fully extended, the wings measure 38.6 feet tip to tip. The first flight in NASA's New Millennium Program, Deep Space 1 is designed to validate 12 new technologies for scientific space missions of the next century. Another onboard experiment includes software that tracks celestial bodies so the spacecraft can make its own navigation decisions without the intervention of ground controllers.Processing payloads, propulsion engines and planetary craft at KSCInside the Payload Changeout Room in the Rotating Service Structure (RSS) at Launch Pad 39B, technicians in clean suits and tethers prepare to move the payloads for mission STS-95 through the open doors of the payload bay (right) of Space Shuttle Discovery. At the top of the RSS is the SPACEHAB module; below it are the Spartan solar-observing deployable spacecraft, the Hubble Space Telescope Orbiting Systems Test Platform, and International Extreme Ultraviolet Hitchhiker.